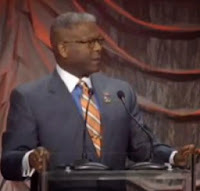 Former Congressman Lt. Col. Allen West spoke at the Western Conservative Summit today in Denver, Colorado. West began his speech by addressing the theme of the Summit "America At Its Best". This is why Allen West is so loved by Conservatives. Screen grab from Western Conservative Summit speech. The theme of this conference is "America at it's best" and I believe that the problem that we have in America is that we don't go out and tell people what America looks like when it is at its best. So therefore, people can come along with trite little messages, sound bites, bumper sticker-type of slogans (like) "hope and change", "change we can believe in", "we're the change that we've been waiting for" and Americans fall for it. So I want to tell you right now the first thing about America being at it's best. It's the fact that a young man born in 1961 in the inner city of Atlanta, Georgia can stand here before you at the Western Conservative Conference and it is not based upon the color of his skin but it's about the content of his character. And the sad thing is that when America is not at its best you have people like Barack Obama and Eric Holder that want to complain about skin color because they are devoid of character. That's the difference between America at its best and America not at its best.